oday we attempt to answer the age-old question: “Why is your cat pic getting more likes than mine?” Spoiler alert: we couldn’t pinpoint the exact science behind it, but we were at least able to pick the brain of a top Instagram photographer to give us his insights and advice for garnering more Instagram likes of our own. Meet Jerm Cohen — photographer, Instagram hero, and social media maven extraordinaire. We were lucky enough to catch up with him as he was experimenting with our brand new LG G5 and LG CAM Plus to ask him a few questions. Nice to meet you, Jerm. Can you tell us a little bit about how you got started? My father took my family on a trip to Yellowstone National Park when I was 15 years old. He brought along an old point-and-shoot camera, and seeing the shots he took really sparked my interest. For my 16th Birthday, I asked for a camera and the rest is history. Now, here I am working as a portrait photographer as a career. How did you get started on Instagram? I was one of the first to sign up for an account when the app came out, but I wasn’t really active on it until later. Now, I take it more serious and it’s become like a professional portfolio for me. So what was that moment when you really started getting people’s attention? I started a series of photos that became really popular. #PizzaPortraitz. The concept was super simple. I took portraits of people wearing pizza costumes and everyone really seemed to love it. So what’s been your most popular photo so far? It’s actually a photo I shot of the LG V10. That’s a beautiful shot. Can you tell us more about it and why you think it was so well liked? I went out to the Brooklyn Bridge at sunrise and wanted my shot to convey a sense of action. People are attracted to that kind of energy and seeing common places or objects shot in unconventional ways. That’s very insightful. Do you have any other tips for people to increase likes on their own photos? With smartphones, everyone has the ability to become a photographer. Now, it’s your responsibility to make yourself stick out. It helps when the photos you post aren’t completely random, and ones that particularly shine are personal projects and themed series. The more you shoot, the better. Are you noticing any trends in your most popular posts? Anything skyline related or things that give people a sense of New York City. I have a feeling people are wanting to live vicariously through these photos and see things from a different perspective than what they can just Google. We see you got your hands on the new LG G5. Can you tell us what you think? My favorite feature is its wide-angle lens. It’s a huge deal. On a regular camera, I’d have to carry and switch out different lenses to achieve the same effect. But on the LG G5, it all happens by just pressing a button. You’re even holding the phone like an actual camera. It definitely feels more natural to hold using the LG CAM Plus. This is one of the LG G5’s companion devices you can pop in because of its modular design. Along with a button to take a picture, there’s also a dial for zooming, and a one-click button that directly opens up camera mode. That’s so important because life happens fast, and this allows me to be able to catch things with a quick response. Do you have any final advice for any aspiring photographers? Keep taking photos. Never stop, and keep the ball rolling. If you love taking photos, continue doing it, and your enthusiasm will shine through. And with that final question, Jerm had to be on his way. However, we were left with more than a few nuggets of wisdom that got us excited to venture out on our own to start taking some inspiring photos. Thanks, Jerm! Keep up with the continued success, and be sure to follow his work at Instagram.com/jerm_cohen. Do you have any photography tips of your own? 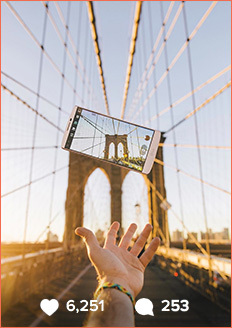 Excited about the LG G5 and its photographic potential? Drop us a line in the comments below. We’d love to hear about it. Use the search box below to find a particular blog post or article. Results will include Executive Insights, Product News and Newsletter articles. For LG.com, use the search box above. Yes, please add me to the LG Newsletter mailing list!